By popular vote, the city of Lathrup Village won the 2009 Community Excellence Award for the Lathrup Village timebank, a pay-it-forward concept of neighbors helping neighbors. Kim Hodge lived in Lathrup Village for 15 years and only knew a handful of her neighbors. When she read about TimeBanks, she knew she wanted to start one. She kicked off the concept at a 2008 Homeowners Association Pancake Breakfast, and it’s grown to 117 members. “We’ve got something cool in Lathrup Village, but we need others to do it,” Hodge said. At its most basic level, TimeBanking is about spending an hour doing something for somebody in your community. That hour goes into the TimeBank as a “time dollar.” Then you have a time dollar to spend. It’s a simple idea, but it has powerful ripple effects in building community connections. “In the economic times we’re dealing with now, I think it’s a great thing that people can help people,” City Administrator Jeff Mueller said. 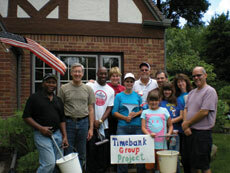 Since its inception, Lathrup Village TimeBank members have logged 3,229 hours of service exchanges. 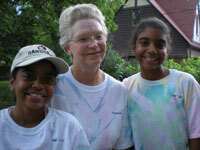 TimeBank member of the year Nancy Hatcher and granddaughters. Richard Reeves, along with Hodge, coordinates Lathrup Village’s TimeBank. “Now is a better time than any to have a TimeBank in a community,” he said. Each TimeBank connects to an internet database where you list what you would like to do for other members. You look up TimeBank services online or call a community coordinator to do it for you. You earn time dollars after each service you perform and then you get to spend it on whatever you want from the listings. With TimeBanking, you will be working with a small group of committed individuals who are joined together for a common good. It connects you to the best in people because it creates a system that connects unmet needs with untapped resources. To see what happens each week when you are part of TimeBank is deeply fulfilling, especially if you are helping to make it run. 1) Assets - We are all assets. Every human being has something to contribute. 2) Redefining Work - Some work is beyond price. Work has to be redefined to value whatever it takes to raise healthy children, build strong families, revitalize neighborhoods, make democracy work, advance social justice, make the planet sustainable. That kind of work needs to be honored, recorded and rewarded. 4) Social Networks - We need each other. Networks are stronger than individuals. People helping each other reweave communities of support, strength and trust. Community is built upon sinking roots, building trust, creating networks. Special relationships are built on commitment. 5) Respect - Every human being matters. Respect underlies freedom of speech, freedom of religion, and everything we value. Respect supplies the heart and soul of democracy. When respect is denied to anyone, we all are injured. We must respect where people are in the moment, not where we hope they will be at some future point. If you like to volunteer and give time to your community, TimeBanking is a way to get something back in exchange for your time. Richard Reeves not only serves as one of the coordinators for the Lathrup Village TimeBank, he has also earned time dollars creating two short videos to help promote it. left to right: Jeff Mueller, Richard Reeves, and Kim Hodge. 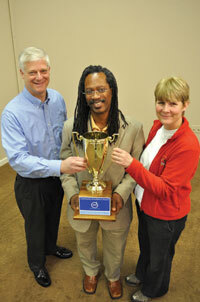 Lathrup Village won the statewide 2009 Michigan Municipal League Community Excellence Award. The project really touched the hearts of Michigan’s officials, who voted for the TimeBank project as the overall winner in the Race for the Cup. “They (Kim and Richard) just absolutely floored the Convention,” said Lathrup Village City Administrator Jeff Mueller. “It was really awesome. 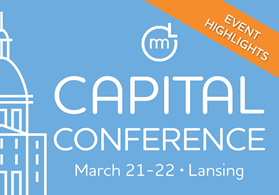 Since the Convention, Hodge and Reeves founded the MI Alliance of TimeBanks (MATB), to link and support TimeBanks across the state. They have been contacted by 74 cities and 80 organizations to find out more about TimeBanks. Three new TimeBanks have already sprung up since the fall of 2009—in the Southfield area, Ferndale, and southwest Detroit. In addition, several Detroit communities are exploring TimeBanking and expected to begin soon. Organizing efforts are happening in Charlotte, Muskegon Heights, Sterling Heights, and many more communities. Who will take home the cup in September at the League's Annual Convention? Tylor Skory and Monique LaBenne are the website coordinators for the Lathrup Village TimeBank.